This cable is used to connect DVD players to audio receivers, satellite boxes and cable boxes to audio receivers, computer audio equipment, or any other equipment that supports digital coaxial (S/PDIF) interface interconnect. This cable allows jitter-free transfer of digital audio signals. The low-loss cable design includes a pure copper center conductor and shielding to preserve signal strength and minimize noise. Gold-plated RCA connectors and pins provide solid corrosion-free contact. - Connectors: single RCA plug (male) to single RCA plug (male). - 24k Gold plated connectors ensure long-lasting corrosion-free connections. - Fully molded connectors provide excellent strain relief. - High-quality coaxial wire with copper braid shield reduces unwanted noise and distortion. - Gold-plated RCA connectors give you solid corrosion-free contact. - Easy installation with non slip rubber grip. 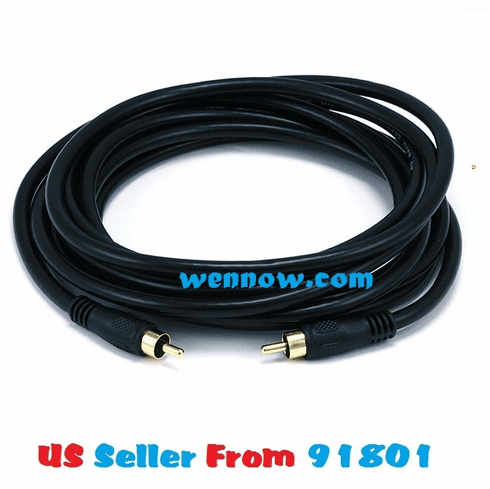 - Improves digital signal delivery as compared to standard RCA type audio cables. - True digital signal maintained by high quality materials and connectors. - 99.999% pure copper non-OFC conductor. - High-density double shielding for maximum rejection of EMI and RFI. What is SPDIF? - S/PDIF (Sony/Philips Digital Interface) is a standard audio transfer file format. It is usually found on digital audio equipment such as a DAT (Digital Audio Tape) machines or audio processing devices. It allows the transfer of audio from one file to another without the conversion to and from an analog format which could degrade the signal quality.